With the completion of the Corvette, I'm happy to announce that all ship assets required for our initial release are now in-game! This is an important milestone that brings us that much closer to release. That said, there's still plenty of ships available that could still make it into a first or second mod release. We're currently short on talented modelers and texture artists, so this is your chance to make an important contribution to this project. Note: while there are only 3 variants of Mon Cal in RotJ on screen, there could certainly be a use in the game for a larger variety, especially filling in gaps between the Nebulon-B and Liberty sizes. They could, but do not have to be based on any existing EU ships. R-22 - Klavs provided us with high-poly model. Needs conversion to be suitable for our mod. BFF-1 Bulk Freighter - We have an old model in-game that doesn't match the visual fidelity of the rest of our ships. Could use a refresh or re-imagining. No work has yet been done here. It's something that many have asked for and would be a nice addition to the mod, but not currently a priority, and not required for initial release. Quality submissions would be welcome. We tried using some assets from another Star Wars mod that were donated for our use and unfortunately found that for our purposes we really need something made from scratch. Any EU ship can potentially be accepted for the project, given it matches the level of quality required and fits thematically. Chief1983 ultimately has the final say as to what will be accepted. It's much more important that the model is high-quality and fits well with the OT movies than matching any existing images/models/data from non-movie sources (including previous X-Wing games). Be sure to search and read through all existing forum threads regarding any EU ship you're considering to avoid repeating mistakes or pitfalls from previous attempts. Why is the Executor is on this list? Because it was in the ESB and RoTJ, I suppose. Notice that this list pretty much covers every important ship that appeared in SW movies, besides the ones already in FoTG. As Dragon said, just because it's a movie ship. That said, we're not looking for a fully-functional and detailed Executor - and not just because of the insane amount of work it would require to make one up to the standards of the mod. There's just no real way we could balance it against our other ships and we don't have any real need for it in the game at this point. Granted, skimming along the entire length in an A-Wing would be awesome, but probably not worth the work it would take. Currently Water is looking into creating a "LOD" model to be used in the background of missions, that you'd never get close enough to actually engage. I also added the Corellian Gunship to the list. It just needs a texture but nobody owns it currently. Lots of points make sense and yeah the model is not that good quality. About the mid ships... what happened with the interdictors, victory class, nebulon B and B2 class frigs for the imperials? aren't those the middle ground between dreads and ISDs? Yes, but they are not modeled yet. If you can pull them off in Brand's quality, feel free to take on some of those, too. Looking into it, including the EU the imperials have a good size spread. the Rebels/Alliance on the other hand has a big gap between 752 meters for captured/defected Acclimators to around 1200-1300 for the MC80 classes. if you dont include the Acclimator then you are looking at 700 meters for the bigger Dreadnaught heavy cruiser variants. 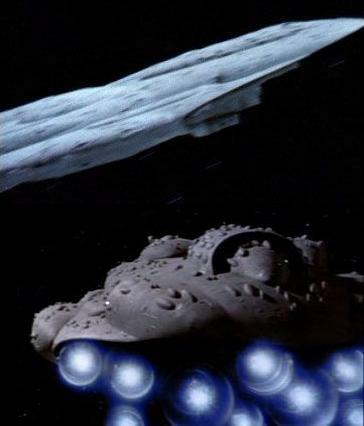 In general, I have a feeling that Dreadnought and Acclamator are the largest "regular" Rebel ships, anything else is a special case, more or less unique mothership. Remember, they're guerillas, not any kind of regular military, despite some stories depicting them as that. Oh, and IIRC, there are 800m or so MonCals. Those MC80s are a pretty diverse lot. I think that if anyone needs larger ships, it's the Empire. They're reliant on capships and actually have resources to field them out in significant numbers. Rebels' biggest assets are diverse fighters, most of the Galaxy's remaining Force-sensitives and superior morality (which is the real reason they win most of the time). Where could I go to get a flat template/model of WIPs needing textures. I've done some textures for 3D work on Cinema 4D models. I'd love to try and help. The wingless Mon Calamari are MC 80a. Independence and Defiance are featured as those ships. with some pics from the movie. Mainly we got the Corellian Gunship, which is UV'd and pretty much only needs texturing. I noticed that I need to clean up the working file a bit before handing it over for texturing though, but that shouldn't take me more than a day or two. If you want to tackle that ship, do you have any examples of texturing you've done to give some idea of how much and what sort of direction, if any, you need? Let me know. I'm all for constructive criticism. If the Empire would just agree to sell advertising space on their ship hulls they'd have this rebellion crushed in no time. Can't view the G+ urls, but even that first one looks pretty good. I'll try to get the working file ready ASAP so I can upload it for you somewhere. Can you handle .max files or do you need it as an .obj or something? I think I have a plug in for Max but I know I can read obj. Either way I may bust out my old copy of 3dsM. How would you need the file back? I'd prefer to get the file back as a .max with everything (object instances, hierarchy, transforms, etc) intact, but if you can't do that then I can live with .obj. If anyone wants to take a stab at the Gallowfree Transport, there's some great shots many of us haven't seen yet here in this compilation. I thought Gallowfree was WIP? It's been abandoned for over 2 years and was never that far along anyways.